This unusual monument has been designed by the famous Ukrainian sculptor Oleksii Vladimirov. The sculpture is 3.5 meters high. 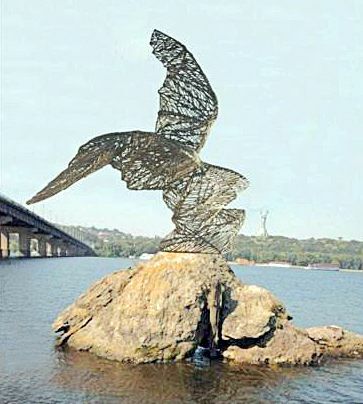 It is made of welded bars of black metal and is expected to be seen from both banks of the Dnipro River and from Paton Bridge. The sculpture will be installed on the ruins of the support of the former Navodnytsky Bridge once the water level in river drops. The project has been initiated by Kiev Fashion Park organization, known for its sculptures at the Peizazhna Alley. According to Illienko, presently the number of modern urban sculptures per capita in Kyiv cannot be compared with Western European cities. Art historian gave an example: in a small German city of Ulm with population of 100-120 thousand people, there are about 300 modern sculptures. “In Ukraine such urban sculptures are in great demand due to the visual hunger, which was formed here in the Soviet times, when the sculpture was either a memorial or of social realistic style and there are practically no small, funny, cozy, and positive art installations,” said Illienko. Unlike many urban sculptures that are already installed in Kyiv, this one is not just an interesting figure, but rather a recognizable, if I may say so, literary character. Maybe, people sailing on a boat past the “Rare Bird” will get a desire to re-read literary works by Nikolai Gogol.